I was out wandering around The Northwest last week, in Boise for a day, then Salem, Oregon for three days and ended up in Portland, Oregon, before flying home, connecting through Seattle. It was a business trip through the end of day Friday, then I took a look around Saturday and Sunday morning since I'd never been there before. Here's the notable bits. I stayed in Salem, the capital of Oregon and also where our Western Regional Office is located. I was looking around downtown to see what that was like and went into a bike store called The Bike Peddler. Nothing notable, particularly, but they had a pretty cool bike hanging up high. 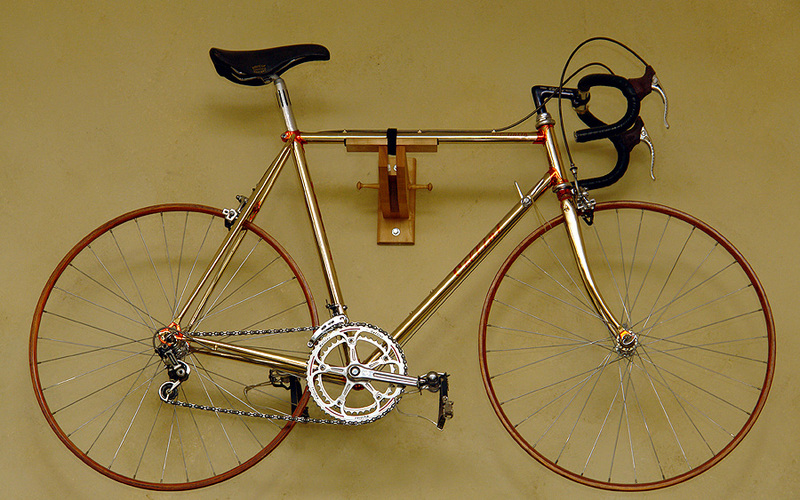 It is called a Cellini and it's very striking, mostly because the frame is gold plated. The photos hardly do it justice. I asked the guy about the bike. He said one of the store guys bought it for $60 or $80 from an estate sale. 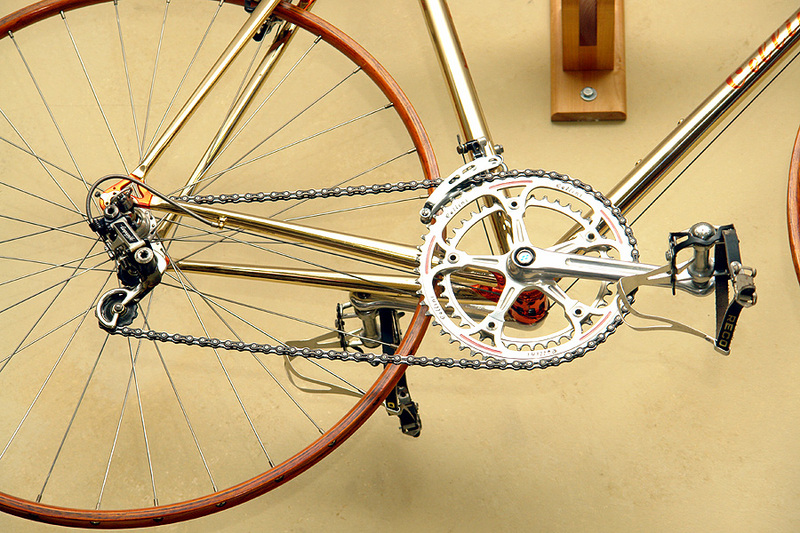 They thought it was about 1982 and was all-Campy on a gold-plated frame with cherrywood rims. 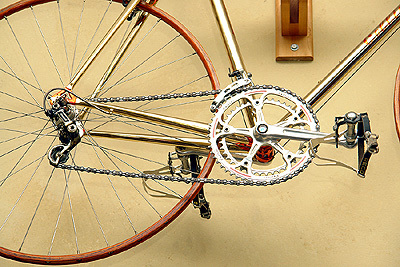 The Cellini name was also engraved on some of the components, like the chainrings. They didn't know many details. 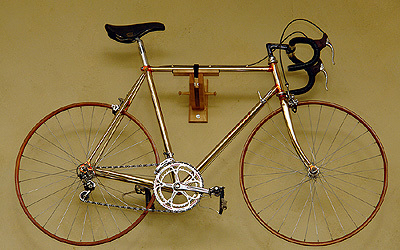 They said there was no bike maker named Cellini that anyone knew of, but that the bike did have the name of Italy's largest goldsmith on it and the initials of a major tradeshow. Maybe it was just showing off. How it came to be in Oregon nobody knew, but here it pops up at an estate sale for under a hundred bucks. The frame was stunning. The components alone would be worth more than the $60 or $80. I should have offered them $150, think of the profit!, but it would have been hard to get home. One of my lesser life goals is to take photos of all the state capitols. It's not a Mission from God or anything, but when I'm in the area, what the heck. I nailed Salem Saturday morning (I got Boise, too, but had shot it before). It's a pretty boring capitol building, as these things go, not big and majestic like Minnesota, Wisconsin and Iowa. 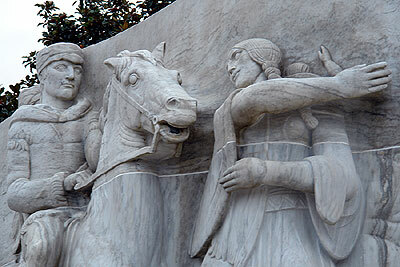 Out front they had inspiring carvings, including this one of some chick slapping a horse. The accompanying notes showed it was Sacagawea leading the Lewis and Clark expedition Westward Ho, and from straight-on it doesn't look so much like a dope slap. You can see a guy standing down at the lower left. It's kind of a novelty aircraft, not an Important Airplane, but it's cool to see it live. It was designed to carry troops and supplies from the U.S. to Europe, overflying the German U-boat menace in the Atlantic. As a seaplane, it would land on a handy body of water and offload through a hinged nose right onto the invasion beach. It would lift 100 tons using its 8 3,000 horsepower engines and was made of wood so as not to use valuable strategic metals or workers needed for other aircraft. As it happened, the U-boat menace faded, ships work lots better for moving lots of men and supplies, these engines would have been nightmares, the plane wasn't done until two years after the war was over and only flew once, for about 2 miles. It has a colorful history, though, and represents the outer limits of piston-engine aircraft development (the wingspan is bigger than a 747s or even Airbus's new A380, although that's partly because they have swept wings). 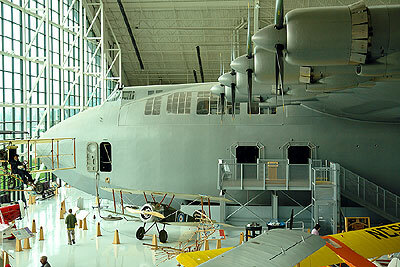 Although I haven't seen it, the movie The Aviator is about Howard Hughes and includes the Spruce Goose tale as part of it. 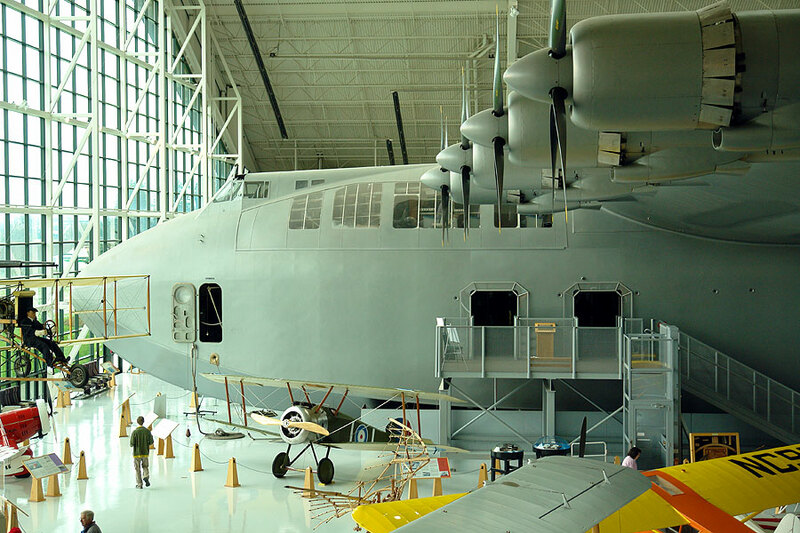 An interesting sidelight is that Evergreen, besides being a global aviation company and owning this museum, also owns a hazelnut farm and a vineyard/winery, so they had a wine tasting going on in the museum. I tried the wines and bought a bottle of 2004 Spruce Goose Pinot Noir and a hazelnut cookbook (plus some nuts), which actually looks pretty good. On to Portland! I originally had plans of spending all day Saturday on a rented bike looking around, but didn't arrive until 2PM in my rental car. I did Plan B, driving (oh shame!) around to several bike shops. I went to Cyclepath which turned out to be high-end racing stuff, but they also had wooden fenders. The guy here was at least straight about them--he said they didn't work that well, since there's no shape to them--they're flat rather than concave. He also said his were varnished where the River City ones are just oiled. OK. Sure looked nice, though, and the Cyclepath guy said his were cheaper because they were made from scraps from a furniture factory or something. 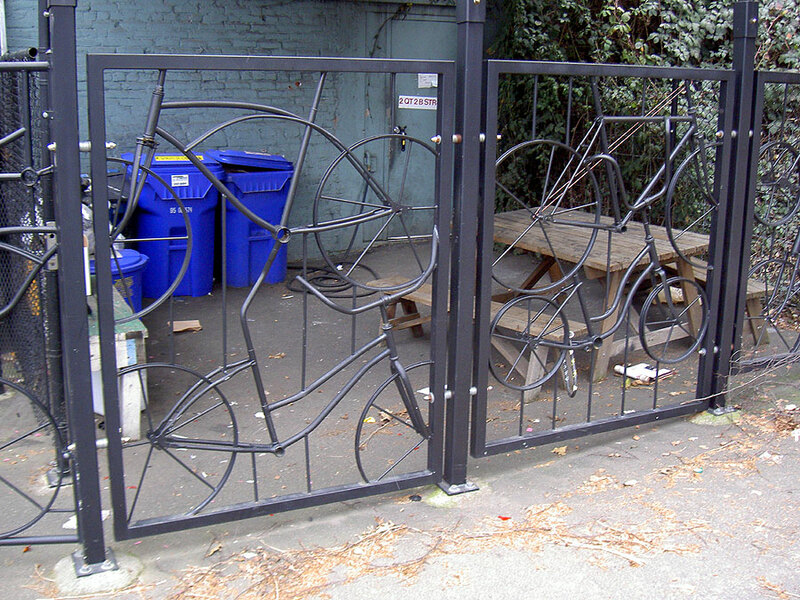 The other item that struck a chord was the Ahearne Cycles flash cage. I have a weakness for flasks anyway, and this is just really appealing in a novelty sort of way. Would it be useful? Not really. I like whiskey, for instance, but basically never drink it while riding. About the only time I take booze on the bike is when I pack 1.5 Gin and Tonics in my stainless steel insulated water bottle and go to the Bike In at the Bell. Still, I like the idea even if it seems to be optimized for the Surly flask. You can check out the rest of the Ahearne products, as well; I like the Grocery Rack with the optional bottle opener. I hit up a couple of other stores as well, it makes a good way to see a city, trying to find a whole succession of addresses in a place you've never been before and without benefit of a navigator. The city seemed like a mix of the Twin Cities and San Francisco, with some big hills (though not as many as SF) and crowded streets. It was about 27 and cloudy but at least it wasn't raining. Sunday morning I went to an Episcopal Church downtown and then, leaving, took a wrong turn and head up the hill towards the Zoo. I'd read about Zoo Bombing, a bike culture thing in Portland, where they ride the (excellent) transit system to the Zoo, up on the heights, and then ride down. This is often done on kids bikes or BMX bikes and for the more daring includes getting onto Highway 26, a virtual Interstate, where the circa 50mph speeds allow them to blend with the traffic. It helps to be young, stupid and drunk, apparently. Me, I was just stupid, got off at the Zoo exit, crossed the highway and headed back down and then off to the airport. It is a long steep hill and I can imagine getting going faster than hell on the way down. Nowadays when I go fast down hills, like over 30 mph, my thoughts drift towards the pragmatic, like, hmmm, I wonder what would happen if my front wheel blew? Or if someone pulled out of a cross-street? I don't enjoy it quite the way I used to. Anyway, half a day of driving to bike stores gives only the faintest hint of the bike culture out there. Next time I'm out maybe I'll do it in a more attractive time of year and actually spend a couple of days in Portland on an ill-fitting rental bike. It would be cool to see some of the luscious Vanilla Bicycles and maybe try out a Stokemonkey, both Portland-based enterprises. As bleary as 27 and cloudy looked, it at least wasn't 36 and rain. Two days after I left they had a big snowstorm and there were enough photogenic wrecks it made the news here in the Cities.